Luckily, others such as Droid-Life captured the information, which show a landscape orientation dock expected to cost $49.99 with an anticipated launch targeted for the week of August 24. According to the data, the dock will use a microUSB cord and wall charger, which will refresh the Nexus 7 battery through the metal pins. Also included is a 3.5 millimeter jack for external speakers. The Nexus 7 will likely change to a software “dock mode” when placed into the accessory. Also planned is a $39.99 premium leather cover that doubles as a stand for the Nexus, which could be handy for watching videos when not docked. The leaked information shows that more color choices will be coming to the standard Nexus case, which is currently available in dark gray for $19.99. If these products are legitimate — and based on the post takedown, I suspect they are — I could see a Nexus 7 dock in my future. Currently, I plug the tablet in and leave it on my nightstand, but it’s not readily useful. With the tablet in an angled view and still taking a charge, the Nexus 7 would be a handy bedside media player and alarm clock. 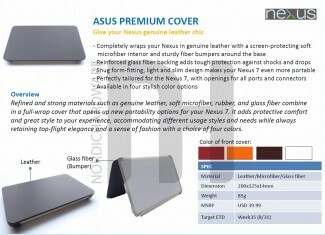 Why is no one raising a ruckus over this…its been months since the Nexus 7 launch and there are NO accessories from ASUS. Hmm $50 for a plastic holder. That’s overpriced compared to $250 for the tablet itseflf. It doesnt connect there. If you look at the longer side of a Nexus 7 you will see some small metal contacts which some people seem to be calling pogo pin contacts. these metal dimples are where the dock makes its connection. What I want to know is if the usb connector will be useable while docked. I could then use this as a headunit in my car with a small usb hd tucked in the dash connected via usb and still charge the Nexus 7. You can change the setting so that it does go in landscape mode when you change orientation. I like the idea of a landscape dock, but won’t the fact that the Nexus 7 desktop is locked into portrait mode cause some annoying problems. Mark, if older Android devices and docks are any indicator, the Nexus 7 would likely appear in a touch-friendly, landscape dock mode when placed in the dock. Shouldn’t be a problem. Additionally, with some rooting, you can force allow landscape in hand mode. If you use Nova or Apex launcher the dock icons rotate, as do all your other icons/widgets. The latest Jelly Bean update, 4.1.2 rolled out today and includes auto rotate / landscape mode for the desktop. So, the only question that remains is: WHERE THE HECK IS MY DOCK????? Hey Mark. JB 4.1.2 will solve the issue so not to worry.